This article is a short summary of Wario World. 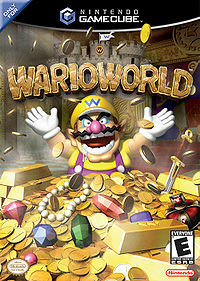 Wario World is a Nintendo GameCube game in the Wario series. "READY TO RUMBLE WITH WARIO? You'd BETTER be ready, punk! Some evil jewel transformed all of my treasure into monsters, and now I gotta go to this weird world and beat it out of 'em! There are plenty of goons waiting for a shot at old Wario, but don't worry about me, baby—I'm ready to brawl! I'll be throwing punches, charging through crowds, and piledriving ugly mugs right and left. What you gotta worry about is keeping me alive. Can you handle that, or do I have to give you a knuckle sandwich too?" This page was last edited on 17 September 2013, at 01:12.